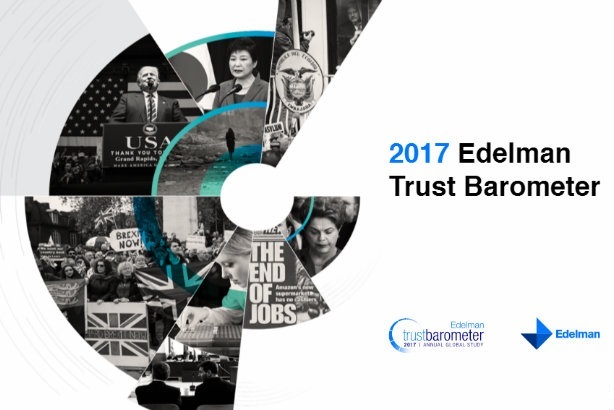 The British public's trust in business, government, media and NGOs is plummeting because of an "unprecedented crisis of trust shared across the Western world", Edelman's Trust Barometer 2017 has found. And ominously, the firm's UK chief Ed Williams has warned that 2017 "could be far worse" than last year in terms of people feeling "let down by the system". The report, now in its 17th year, questioned 33,000 respondents globally including 1,150 people in the UK during the Autumn, either side of Donald Trump's election as US President. And for the first time, a separate UK-specific supplement was produced, based on a survey of 1,500 members of the British public, conducted in the final week of 2016 and the first week of 2017. The report shows levels of trust in the UK government, media, businesses and NGOs have all dropped sharply - not just over the 12 months between the 2016 and 2017 global reports, but between the Autumn and end of year surveys. It follows a rebound in trust witnessed in the 2016 report. The number of people in the UK saying they trusted the media fell from 36 per cent in 2016's Trust Barometer to 32 per cent for the autumn survey. Figures from the end of year research show that trust fell further, and now sit at 24 per cent. Charities, meanwhile, took the biggest trust hit, dropping from what the report terms a "neutral" position of 50 per cent trust in 2016, to 46 per cent in the autumn, to 32 per cent at the turn of 2017. The UK Government, in which trust was already low at 36 per cent last year, recorded the same level of confidence in the autumn report, but then saw confidence fall to 26 per cent by the start of 2017. Trust in UK business fell only marginally from 46 per cent last year to 45 per cent in the autumn, but then plummeted to 33 per cent, according to the data for the start of 2017. According to Edelman, the plunge in national confidence in recent weeks was caused by an "acute sense of foreboding" that most people believe cannot be solved by politicians and business leaders. Despite confidence in business tumbling, the global barometer report argues that trust can be regained if companies learn to play a more positive role in society. To do this, businesses must have conversations with customers, communities and workers, as opposed to talking at them, it says. Businesses are advised to harness the potential of "ordinary employees" as spokespeople. Social media is deemed by the public to the best medium for businesses to communicate, ahead of traditional advertising. The UK section of the global report also reveals a divide created by of Britain's vote to leave the European Union. Only 31 per cent of people said they were more confident about their futures because of the referendum, while 36 per cent are more worried and 29 per cent remain unchanged. Those on high incomes - typically between £100,000 and £650,000 - were found to be more confident than those on very low incomes - typically less than £15,000 - by a margin on 49 per cent to 33 per cent. However, the Barometer reveals that the Brexit vote itself was not the main cause of uncertainty. Britons are most fearful about factors including immigration and the speed of technological change, which has led them to believe society is "not fair", the report shows. Edelman UK chief executive Ed Williams said: "If we thought 2016 was bad, 2017 could be far worse. The virus that has understandably destroyed trust among those who feel let down by the system has now obviously spread. Edelman Trust Barometer breaks down how Trumpism stormed the U.S.